The 'season to be jolly' is definitely not happy for everybody. Those who have Seasonal Affective Disorder must endure, rather than enjoy, the winter months. Until now, that is. With winter comes cold, darkness, and for some people, a bout of sadness. Sometimes, cuddling up on the couch and watching the snow fall becomes a depressing habit rather than a happy moment. Those who can track their emotional problems with the colder weather may have Seasonal Affective Disorder (SAD). SAD is a classified type of depression that occurs during certain times of year, generally during the winter months. SAD is a real thing and it affects millions of people each year. It's also more common in women than in men. To manage your symptoms—especially if they're particularly severe—you may want to see a medical professional or psychologist. Serious cases of depression can be treated with counselling support, prescription drugs or both. For those who know they're affected by the winter but don't have symptoms bad enough to warrant a visit to the doc, depression symptoms can be managed at home. Even if you aren't generally affected by the winter months, these four anti-depression techniques may retain your personal light, warmth, and happiness during the snowy season. Vitamin D, often termed the "sunshine vitamin," is produced naturally by the body when the direct sunlight hits the skin. During the winter months, when sun exposure is almost non-existent, you're more likely to run a deficit. Vitamin D is important for the absorption of calcium. Without sufficient levels, bone remodelling won't take place as it normally does, which could leave you suffering from weak and brittle bones. Vitamin D is also essential for cell growth, maintaining the healthy function of the immune system, and reducing inflammation. Getting the proper amount of vitamin D will help ensure that you feel your best each day, and, should you feel the symptoms, decrease the severity of SAD. Unfortunately, few food sources contain naturally high doses of vitamin D, so supplementation will probably be your best strategy. You can get some extra vitamin D from beef liver, cheese, and egg yolks. For supplementation, take at least the generally recommended 600 IUs per day. Light therapy is generally useful for people who don't get enough vitamin D. You can get light therapy by using special, very-bright (3,000-10,000 lux) lamp. 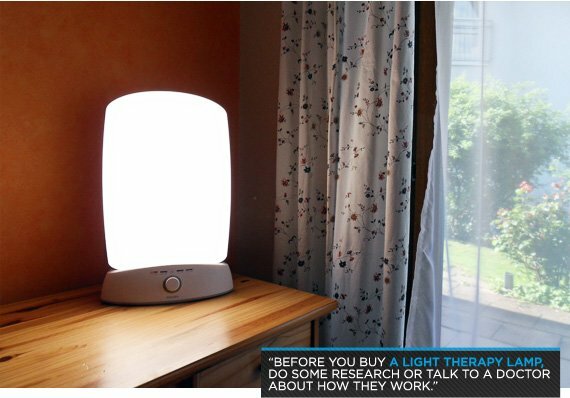 This lamp or "light box" can help your body naturally create the vitamin D you need. The light can also ease the symptoms of depression. Light therapy isn't foolproof. It works better for some than others. Light boxes can also cause headaches and eye problems. So, before you go buy one, make sure you do some research or talk to a doctor about how they work. When you're down, the last thing you feel like doing is going to the gym. However, exercising can be one of the best ways to combat depression. Taking part in a regular workout program is going to boost your well-being by causing a flood of feel-good endorphins. 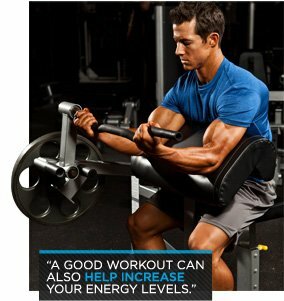 A good workout can also help increase your energy levels. If you're exercising to help ease your SAD symptoms, focus less on the muscle-building or fat-loss results of your workouts. Find something that you enjoy doing: yoga, dancing, swimming, or lifting. Focus on the fun, or do it for how good it makes you feel. It doesn't matter which exercise technique you use, just make sure it's something you are motivated to do multiple times per week. Right now, you're exercising for your mental health, not for your giant biceps. Because winter days are short, you don't want to waste them by sleeping. It's best to be awake as much as possible for the sunlight hours so you can expose yourself to the daylight as much as you can. To regulate your sleep hours, go to bed at the same time each night and get up each morning at the same time. This helps keep your body in a routine. 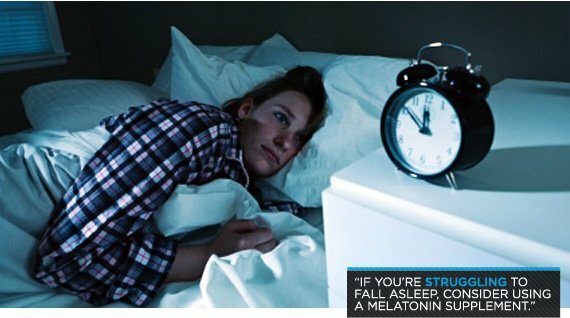 If you're struggling to fall asleep, consider using a melatonin supplement. Melatonin can help to regulate your natural circadian rhythm, making it easier to go to bed at night and wake up on schedule.